Miniature Maven Diaries: Jazzi's Christmas in July Presents! I was very happy to have the wonderful Jazzi herself as my swap partner for the Christmas in July swap that she organized. I have been away, and away from the internet. I arrived home last night to discover some wonderful treats awaiting me. Without further ado, here are Jazzi's wonderful creations, which were made from found objects. I love the little pillows ! The rest of the things will be great for a Christmas scene. I am usually a total blabbermouth whenever I post, but again, I've been dealing with that pesky old thing called Real Life so I'm actually quite bushed! I have decided to close my Etsy shop right now because I don't want anything to sell, I'm saving it for the show and sale in September (15th), but who's counting? Probably not only me! I hope wherever you are and whatever you're doing, my dear readers, you are safe, happy and enjoying the blessings of friends and family. Yes, I love them! I am going to be working on two projects just for me next year. My Christmas Kitchen, and a small beach house cottage, which is my interpretation of a camping/trailer project, which is our mini club's yearly project next year. I think I will do everything in my power to pull it off, Jaz! I can be quite the bossy boots when I put my mind to it, and I can always convince Matty to stuff his t shirts and things around them. I would love to send back a shadow box for both you and Indy Poppy. They are so inexpensive for my Dad to make, since he has all the right tools, but the postage would be ludicrous, and I'd be worried the plexiglass would crack, or that it would get lost in customs. If it were in Matty's luggage that would be an altogether different thing :P It could be a long wait though as Mark and I just convinced him to come with us to Galliano island with us next summer. (It wasn't that hard.) He quite likes Canada and is signed on to illustrate a long list of children's books for a Canadian Author. Congratulations on your your lovely gifts. I am also fortunate to have received gifts from Jazzi. Items sell items, so I hope you manage to make a lot of minis to your show in September. I just got back from vacation and has it exceptionally great. I am very much in agreement, darling! Hey Ruth! So nice to hear from you again and what a wonderful Welcome Home! Nice to find presents awaiting you! Christmas in August! I agree, back off Real Life; it is Playtime! 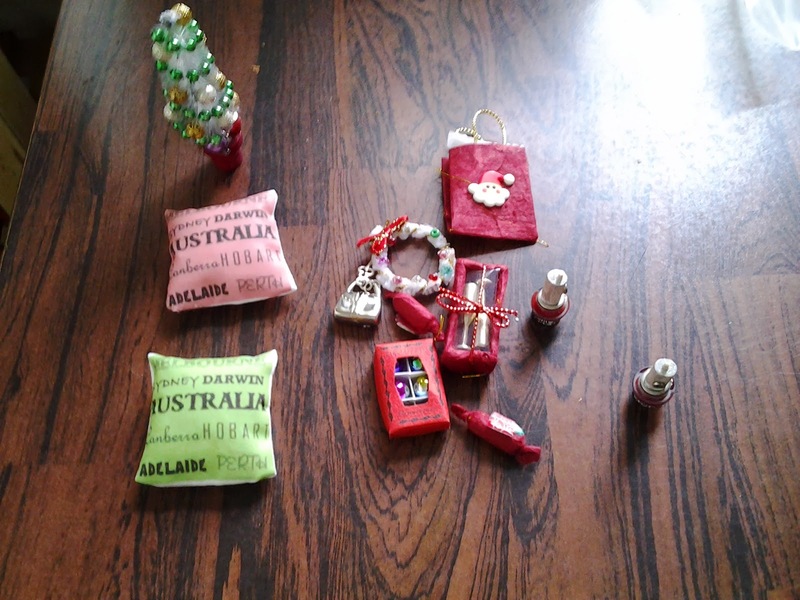 The gifts are so cute and quite useful for Christmas decorating. I can understand closing your shop and concentrating on the show for now. I hope everything is going well and that your new group is going great. I'm praying for you. Thanks Caroline! The group is great, I love it! I wish I'd asked for help sooner, but the facilitator said sometimes we have to wait until we're ready. I really appreciate your prayers.